Anyone tuning into “Jeopardy!” this past week may have seen a familiar face. UFC veteran and TUF 8 competitor Dave Kaplan was a contestant on the popular TV quiz show. Per MMAJunkie, Kaplan came up short against opponents Anneke Garcia and returning two-day champion Jessica Holloway. According to the article, Kaplan had a strategy of picking the higher-dollar clues and went to “School Within a School” for $2,000 – which had Daily Doubles in the round. The former UFC lightweight then went for broke by wagering his full $4,400 – which would have put him just $800 behind the leader. But a mistake on choosing Penn State instead of Carnegie Mellon, it dropped him to $0 and he was never able to recover. Towards the end of the came – with three clues left in the “Theater” category – Kaplan was still mathematically in the competition. Garcia ended up ringing in first on the $1,200 clue which make sure Kaplan would finish without any money in his bank account. 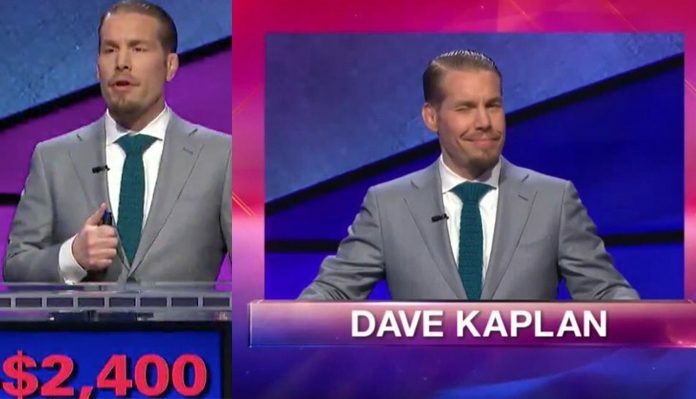 With that final blow, Kaplan became ineligible for Final Jeopardy, and Garcia went on to win the game by knocking off the two-time defending champ Holloway. Dave Kaplan (3-4) hasn’t competed in MMA since a July 2010, TKO loss to Dominique Robinson at Tachi Palace Fights. The 39-year-old is perhaps best known for competing on Season 8 of “The Ultimate Fighter where he was a part of Frank Mir’s team. Kaplan earned his spot in the TUF house by submitting Fernando Bernstein in the first round. Mir went on to select Kaplan as his third overall pick. Kaplan would go on to lose to eventual finalist Phillipe Nover in the first round and was eliminated from the tournament. He also had a noteworthy moment where he taunted Tom Lawlor into punching him while he was drunk. Lawlor obliged and knocked out “Diamond” with one punch. Despite his disappointing run on the show, Kaplan was awarded a shot in the UFC against controversial TUF 8 contestant Junie Browning. The Nevada native would make his promotional debut at The Ultimate Fighter 8 Finale in Dec. 2008. Browning ended up submitting Kaplan in the third round, which marked back-to-back losses for the first time in Dave’s career. Even with the setback, the UFC gave Kaplan another opportunity in the octagon as he faced Team Mir teammate George Roop at UFC 98. Once again, Kaplan would fall short losing a split-decision and was subsequently released from the UFC. Kaplan eventually retired from MMA with 3-4 overall record.